“Italy fully supports the reconciliation between Eritrea and Ethiopia, their economic growth and sustainable development” – FM Moavero. The Foreign Ministers of Eritrea, Ethiopia, and Italy held a tripartite meeting on the margins of the Second Italy-Africa Forum in Rome. Issues discussed include enhanced economic cooperation; joint work for stabilization of Somalia; as well as the lifting of UNSC sanctions on Eritrea. 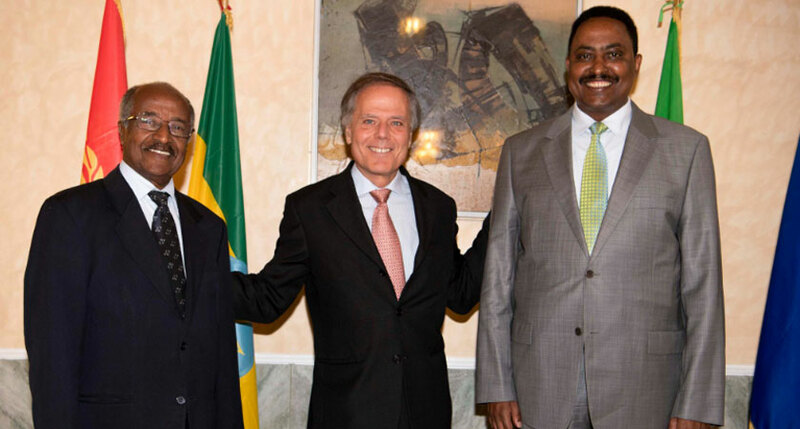 The Minister of Foreign Affairs and International Cooperation, Enzo Moavero Milanesi, had a meeting today at the Ministry of Foreign Affairs with the Minister of Foreign Affairs of Eritrea, Osman Saleh, and with the Minister of Foreign Affairs of Ethiopia, Workneh Gebeyehu, on the eve of the Italy-Africa Ministerial Conference. Today’s meeting is the second, in the space of one month, after the one organized in New York alongside the United Nations General Assembly. In addition, less than two weeks ago, the President of the Council [Prime Minister], Giuseppe Conte, visited Addis Ababa and Asmara. All of this testifies, first of all, Italy’s strong support for the path of full reconciliation between the two African states, culminated with the recent peace agreement, which is already producing positive effects throughout the region. The three ministers also hoped that we could work together for the stabilization of Somalia. Minister Moavero, recalling the Italian closeness and friendship towards the two countries, assured that Italy is ready to accompany its economic growth and sustainable development, with a strategy based on a triptych of possible initiatives. Firstly, an industrial and investment cooperation that includes infrastructural projects to foster the modernization of the links between the two countries, installations for the production of energy, especially from renewable sources and the relaunch of concrete actions that promote sustainable and inclusive development dynamics. Secondly, a further strengthening of trade relations between the three countries, also with a view to promoting a future area of free trade and regional integration in the so-called ‘Horn of Africa’. Thirdly, a collaboration in the field of culture in order to foster a better mutual understanding of the past and present creative liveliness of the peoples of the three countries, with particular attention to the sectors of education and vocational training opportunities for the younger generations. 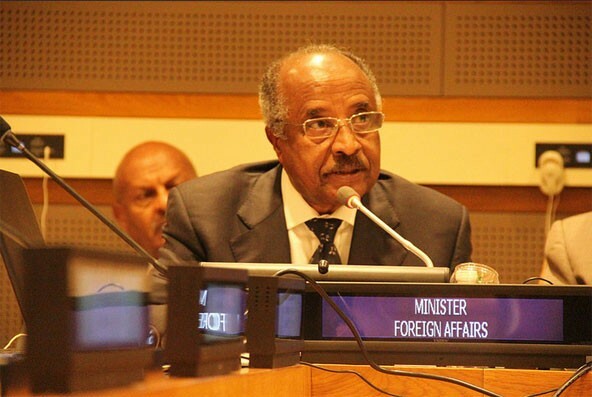 Lastly, the Ministers have focused on the importance of supporting the removal of the Eritrean sanction regime imposed by the United Nations in 2009, the first step to promote the full reintegration of Eritrea into the international community. Many think that the peace was preceded by protracted behind-the-scenes negotiations. That was not the case. The first time that the two sides met and talked was when the Eritrean delegation landed in Addis Ababa. And it was not just a physical encounter. It was a meeting of minds. Eritrea and Ethiopia have not just made peace. They have embarked on a partnership of complementarity and synergy, determined to make up for the lost time and opportunities. They are prioritizing joint interests and investing in joint programs and projects. They have opened their common borders for the free movement of people and goods. Eritrea and Ethiopia have not limited themselves to forging the closest of bilateral relations. They have embarked on jointly fostering a regional partnership. Already, Eritrea, Ethiopia, and Somalia have signed an Agreement on Comprehensive Cooperation in a tripartite summit in Asmara. They are determined to make it inclusive of the whole region. They need and welcome the contribution of all external partners, including, of course, Italy, which has a long association with the region, as was underlined by the recent visit of Prime Minister Conte to Ethiopia and Eritrea.